About 10 minutes before boarding time one of my companions and I left our third companion in The Cabin (his flight was an hour later) and headed back upstairs to our gate, which was only about two gates away from the entrance to The Cabin. Boarding started on time and we entered through door 1L, turned right and went through the small (8 seats) first class cabin and into the first of the two business class cabins. Though our flight was on Cathay’s regional subsidiary, Dragon Air, I can’t imagine there was much difference between this plane and the Cathay B777 our friend flew an hour later. I didn’t seem to get a photo of the seats though they reminded me a bit of those in Turkish Business Class. 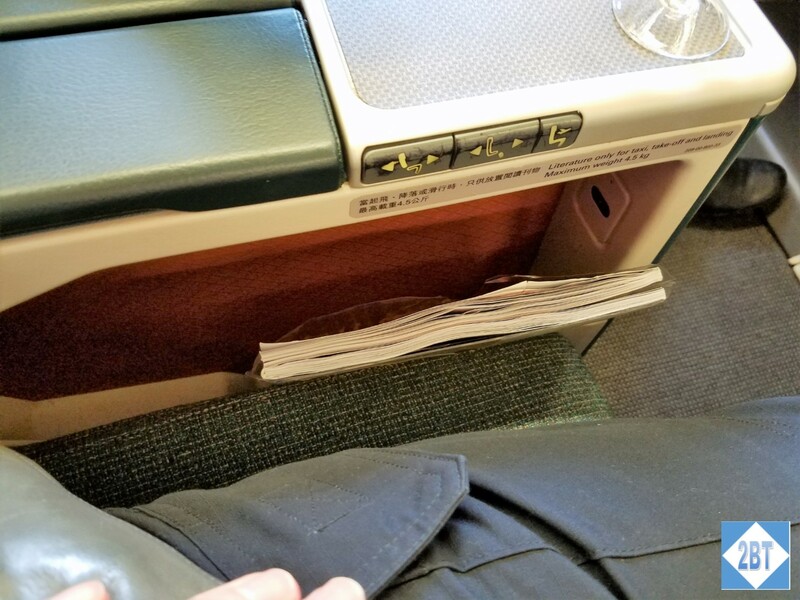 Seat controls were built into the side of the armrest, above the magazine holder.